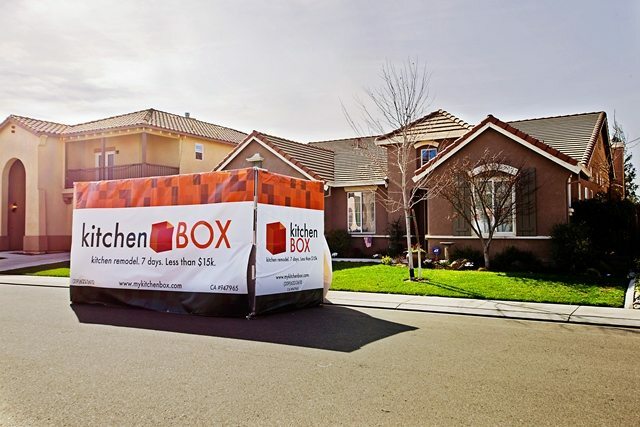 KitchenBOX Copper Bridge Court Begins in Modesto, CA! We love a good challenge here at kitchenBOX. And wow, do we have a challenge with today’s project start! This huge kitchen in East Modesto features the most significant scope of work to date: the base kitchen box, plus LED can lighting, pendant lighting, high-end granite tops, glass tile backsplash, cabinet addition, cabinet modifications, LED undercabinet lighitng, fireplace tile installation and more. We’re getting tired just writing about it! When we received the initial call from the Copper Bridge Court homeowner it was for a custom remodel. After chatting for a few minutes and then visiting the project, we realized that despite the significant scope of work, this project still fell well within the kitchenBOX capabilities. The homeowners were very excited to hear about our exceptionally quick turnaround (most similar remodels take 6-8 weeks), and our competitive price point. These features, combined with our ability to to customize the kitchen to the homeowner’s needs, made kitchenBOX the clear-cut answer to their remodeling quandary. Countertop and Backsplash: White 6″ square tile with tan grout. Cabinet Finish: Clear-coat over natural white-washed wood. Lighting: Track lighting and small light boxes. In addition to the base kitchenBOX elements, this homeowner is adding LED can lights, LED undercabinet lighting, fireplace tile, a cabinet extension at the island, cabinet modifications in preparation for a wine refrigerator, new upper cabinets over the bar, new shelving at the bookshelf, rough-in electrical and cable for a new wall-mount TV and pendant lighting over the island. Refinish the cabinets, doors and drawers with a Chestnut stain. Fabricate and install MSI Mascarello granite countertops with a bullnose edge. Supply and install Emser’s Cream 3″ x 6″ glass tiles. This will all be grouted using Laticrete Almond grout. Install a new single bowl Kohler Bakersfield under-mount sink in Biscuit. Install a new Kohler Simplice faucet and soap dispenser with a vibrant stainless finish. Install a new Kohler Northland bar sink in biscuit and a new Kohler Simplice bar faucet with a vibrant stainless finish. Remove original track lighting and replace with 5″ LED can lights and pendant lighting. Supply and install new pulls with matching cabinet hinges. Add additional cabinetry at the island and bar. Extend the fireplace tile up to the ceiling. Rough-in for a new wall-mount TV. Want to learn how we can help you achieve the kitchen transformation of your dreams? Simply click here to schedule your phone consultation using our scheduling system. Or feel free to call us at (888) 995-7996! Scott Monday is the Founder and CEO of Trinity Renovation, Inc., the parent company of kitchen& bath CRATE. Learn more about Scott Monday by calling (888) 995-7996 or visit his at Google+ or on Facebook pages.